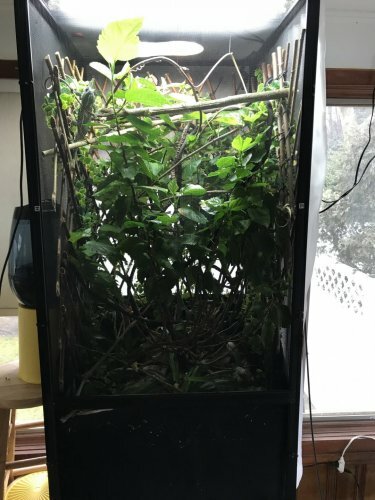 Hey everyone still here(always lurking)decided to make a post about this to possibly warn other keepers about my mistake and hope you don’t make the same,I have a plant liner on a 24 24 48 reptibreeze screen cage it goes about 16 inches up and my Cham has been looking for a mate lately and doing some heavy wandering in his cage.I check on him before I go to work in the morning and did not see him I figure he was doing his 1 dimensional thing behind a branch so I left,I come home two hours ago and now I’m worried because I can’t find him so now I’m panicking frantically searching.....I check the side of the cage and much to my dismay there he is with his sleeping pattern,eyes closed at 1pm sandwiched between the liner and the screen about 5 inches from the bottom of the cage immobile,my heart broke when I initially touch him he did not move at all(had to remove all the substrate weighing on him)but then flared up and slowly started to try to run as much as the space would allow.All bones seem to be fine he’s walking fine and gone back to his normal activity and even ate a darkling that was trying to bite him when he was stuck.....both eyes are working like normal but I think a beetle or roach may have bit him on the eye or it was pressed for to long because it looked slightly wrinkled. Wow scary stuff! Glad he is ok. I would keep an eye on him. See that he returns to normal behavior and monitor his eye. Watch his limb movement to ensure it is normal. If anything seems off take him to the vet. But then again I am a worry wart when it comes to my guy. I hand misted him and he cleaned both eyes as normal but he’s on full watch I put the the pet cam back in and am not taking any chances. Pet cham...Could you post a picture of it? I'm not sure what you mean by liner..plastic sheet around cage? 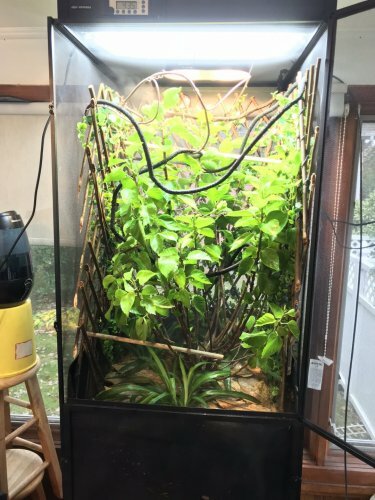 the Plastic sheet is a attempt to retain heat given off by the lights,if you look inside the cage there is a black fabric plant liner runs along the bottom stopping the substrate from directly contacting the screen but still allowing proper drainage.